Celebrating Singapore Shores! : What are the benefits of Singapore mangroves? What are the benefits of Singapore mangroves? A three-year study by NUS mangrove researchers found Singapore mangroves benefit us in many ways. The findings will also help guide future planning for our mangroves and shores. using a total station to survey the topography of a mangrove forest. 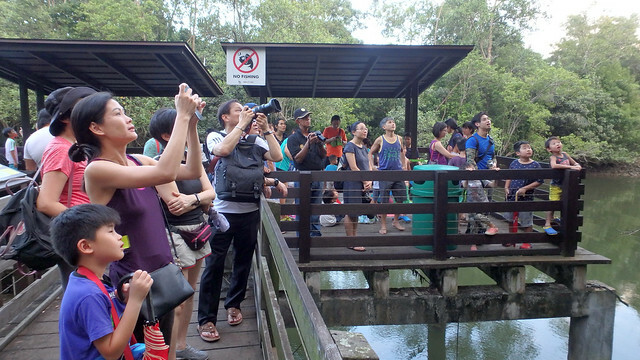 They studied photos posted online and found that Singaporeans love mangroves too! A three-year study conducted by researchers from the National University of Singapore (NUS) has identified and quantified the benefits of mangrove forests to people in Singapore. These researchers concluded that apart from cultural benefits, mangroves act as nursery habitat for fish and as coastal defence, as well as storing carbon that could help offset some of our climate change emissions. 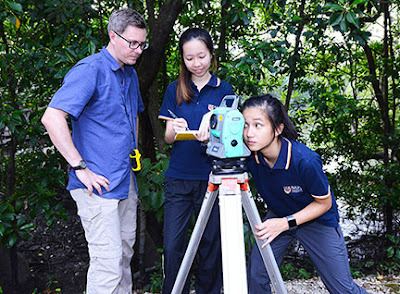 Associate Professor Daniel Friess from the Department of Geography at the Faculty of Arts and Social Sciences at NUS conducted the study with a team of ten researchers, undergraduate and graduate students between 2014 and 2017. A unique outcome from this in-depth study was quantifying the cultural benefits mangroves can offer, through the use of photographs taken and posted online on websites like Flickr. “If someone takes a photo of the landscape, we assume that is because they appreciate, or take value from the landscape; people think the view is nice. That is a type of cultural value. If they take a photo of a crab or otter, they’re valuing the biodiversity there. Taking selfies means that people value social recreation, using the places as social spaces,” explained Assoc Prof Friess. for families at Pasir Ris mangroves by the Naked Hermit Crabs. As the photographs were tagged with their specific locations, the researchers were then able to create maps based on the information gathered to approximate what different segments of the mangroves are valued for. This could be used as a tool to help managers to improve visitor experience in nature parks. Mangroves also provide environmental benefits such as acting as nursery habitat for important fish species, defending the coast against tides and storms, and storing carbon. The team discovered that the mangroves that were sampled had a very different composition of important fish when compared to other habitats. This means that losing mangroves could have considerable impact on the populations of these species of fish. 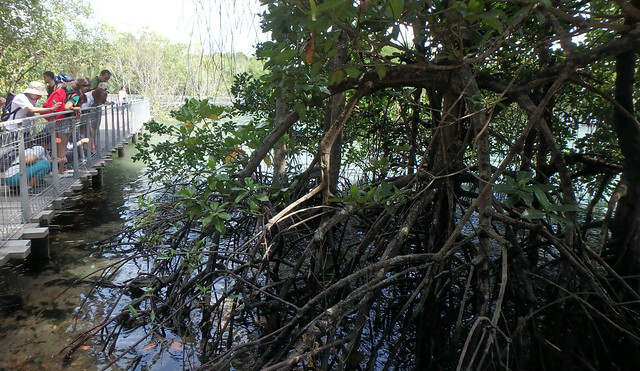 Another observation was that the tangled roots of many mangrove species can help to defend the coast. at the Chek Jawa boardwalk, with the Naked Hermit Crabs. Finally, mangroves take carbon out of the atmosphere during photosynthesis and can store it in the tree and the soil. This carbon storage capability of mangroves outranks many other forests, and can be up to five times more efficient than a tropical rainforest. Their presence in Singapore could thus potentially be useful in offsetting the nation’s carbon emissions. “In total, Singapore’s mangroves store some 450,000 tonnes of carbon, which is equivalent to the annual carbon emissions of 620,000 people in Singapore,” shared Assoc Prof Friess. However, the carbon storing ability of mangroves comes with its downside. Losing mangroves would result in a larger amount of carbon being released into the environment, creating a larger impact. This makes conservation of mangroves even more vital. Assoc Prof Friess hopes that these findings can be used to help guide future planning. “In Singapore and other urban areas, there are a lot of different demands on land, but we can use information on the benefits of mangroves to prioritise and optimise our planning so that we get what we hope is a win-win situation,” he said. This can be used in other rapidly urbanising coastal cities in Southeast Asia such as Jakarta. Assoc Prof Friess and a large team of collaborators have secured funding and in the next step will be using a similar approach to study all major ecosystems in Singapore, including forests, urban landscapes and coastal ecosystems, in order to assess the true state of Singapore’s environment and the benefits they provide to us.